Being able to vote helps involve EVERYONE in the audience. All of the performers did a great job and showed different styles. Also, instead of having the winner of the first vote determine the order it should be Last goes first and First (most votes) goes last. (and becomes the headliner). It keeps it in the audiences hands. Finally, lollipops are okay but unnecessary. But I guess it does encourage people to take the note that says you should vote. If you like magic you are going to like this show. Four magicians are listed but one becomes the MC so he isn’t voted upon or does a 12 minute set. Bring a smart phone with Internet access and decent reception because you get to do some voting online. And, from what I can tell, the voting is legit. Three magicians perform a trick and you vote on which one you like. Then the winner determines the order and, at the end, you vote for who you like the best. 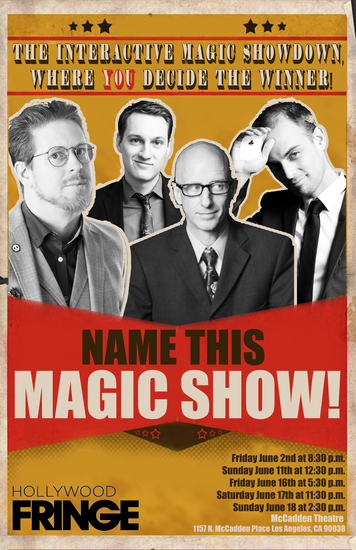 You get to “Name The Show” by chosing which magician wins. All of the magicians are top notch so you will like something in this show. Definitely worth attending especially if you are a magic fan.